Ecomics collects omics data from more than 290 separate studies and subsequently, the number of jargons indexed is massive and in most cases, they are lengthy words, which compliates the display of the database information in a concise way. This necessitates the use of abbreviations and we have made the table that shows what each abbreviation represents in here. Click Database on the top navigation bar. Click Transcriptome on the expanded dropdown menu below Database. Search b-number or name of the gene of your interest in the search box. If you are not sure what b-number is assigned to the gene, plese refer to EcoCyc. If you would like to know what b-numbers are indexed in Ecomics, please visit this page and identify what molecules you see with Molecule Type of Gene in the table. If Ecomics finds any transcriptome profiles having expression levels of the searched b-number, then the page will show the tabulated list of all conditions in the compendium described by Strain, Medium, Stress, and Genetic Perturbation with the mean expression level of the searched gene (the column Expression Level) and the rank of each condition ordered by expression level among all conditions (the column Rank). Otherwise, it will return nothing in two columns of Expression Level and Rank. Fig. 1: The example of searching the transcriptome database. 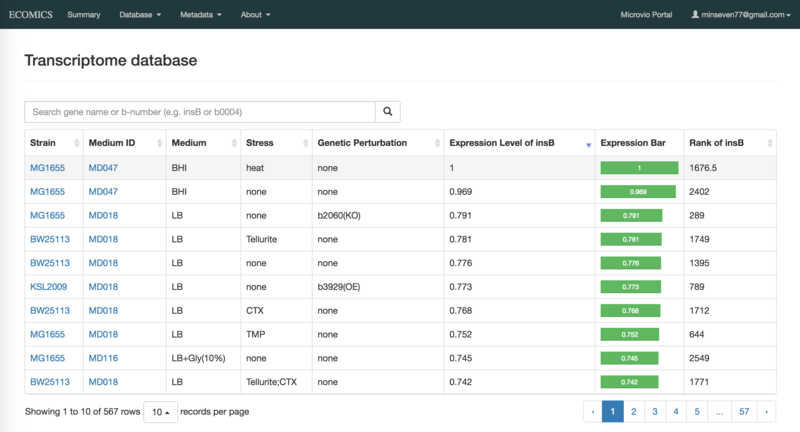 It shows the search results for gene b2381 (ypdB) that list its expression levels (Expression Level) and its rank (Rank) among all indexed conditions. Click Proteome on the expanded dropdown menu below Database. Search b-number or name of the protein of your interest in the search box. If you are not sure what b-number is assigned to the protein, plese refer to EcoCyc. If you would like to know what b-numbers are indexed in Ecomics, please visit this page and identify what molecules you see with Molecule Type of Protein in the table. If Ecomics finds any proteome profiles having expression levels of the searched b-number, then the page will show the tabulated list of all conditions in the compendium described by Strain, Medium, Stress, and Genetic Perturbation with the mean expression level of the searched protein (the column Expression Level) and the rank of each condition ordered by expression level among all conditions (the column Rank). Otherwise, it will return nothing in two columns of Expression Level and Rank. Click Metabolome on the expanded dropdown menu below Database. Search KEGG ID of the metabolite of your interest in the search box. If you are not sure what KEGG ID is assigned to the metabolite, plese refer to KEGG. If you would like to know what metabolites are indexed in Ecomics, please visit this page and identify what molecules you see with Molecule Type of Metabolite in the table. If Ecomics finds any metabolome profiles having concentrations of the searched KEGG ID, then the page will show the tabulated list of all conditions in the compendium described by Strain, Medium, Stress, and Genetic Perturbation with the mean concentration of the searched metabolite (the column Concentration). Otherwise, it will return nothing in the last column of Concentration. Click Fluxome on the expanded dropdown menu below Database. Click Phenome on the expanded dropdown menu below Database. The table on default shows complete list of growth measurements for all the conditions that Ecomics indexed. Each growth measurement consist of Lag Time, Growth Rate, and Final OD. To selectively view the conditions you are ineterested in, type any keywords pertaining to the strain name, medium name, stress, and genetic perturbation.